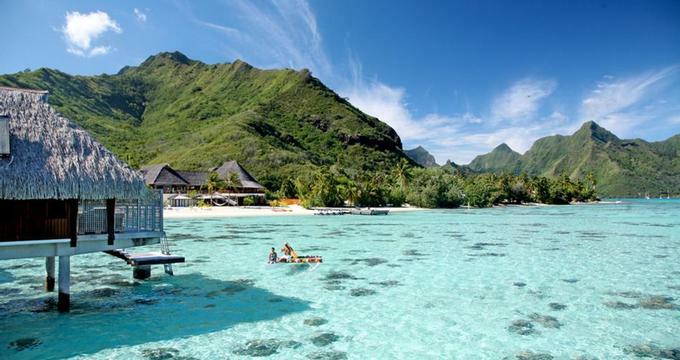 At the Hilton Moorea Lagoon on the beautiful island of Moorea in French Polynesia you will enjoy sweeping views of a 10-acre lagoon, an excellent beach, and numerous water-based adventures. The Over-water bungalows are the ultimate honeymoon suites. The hotel has 54 over-water bungalows and 52 garden and beach bungalows. The Garden Bungalows have individual or twin beds, air conditioning, private terrace, television, phone, mini bar and are located in the middle of the tropical gardens near the lagoon. The Beach Bungalows have the same amenities as the Garden Bungalows and are located on the beach so you can almost fall out of your room onto the sand. The Over-water Bungalows are obviously different from the rest of the bungalows because you can step off your private terrace and into the water and watch colorful fish through the glass opening in the floor. The Over-water Horizon Bungalows give guests an open view over the lagoon and are located closest to the barrier reef which makes them great honeymoon suites. These bungalows also have outdoor showers. The hotel has two restaurants and two bars all with great views. The Arii Vahine Restaurant is open for breakfast and dinner. The Rotui Bar and Grill, located next to the pool, is a more casual place for lunch. Enjoy cocktails and sunsets from a table at the Eimeo Bar or the Toata Bar. The hotel can arrange for guests to tour the Opunohu Valley by 4x4, rent cars or scooters, a circle island bus tour, horseback riding, or mountain bike rentals. You can also charter a speed-boat to sail around the island with a stop on a "motu" for a picnic, or take a sailboat or canoe for a sunset cruise. Fly to (PPT) in Papeete, Tahiti (Faa' a), and then transfer to Air Tahiti for the 10 minute flight to Moorea. If you prefer, you can take a 30-minute catamaran ride from Tahiti instead of flying. Click here for 12 Ultimate Luxury Vacations. Rates start at 44,000 XPF.